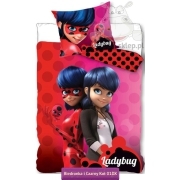 Bedding collection and accessories with Ladybug characters – ordinary girl named Marinette Dupain-Cheng and Cat Noir – Adrien Agreste son of well-known fashion designer. 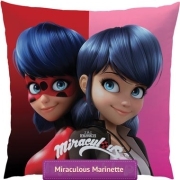 Accessories and bedding set for children with the characters of the Miraculous animated series displayed on Disney Channel one of the most popular kids and teens series of last months. 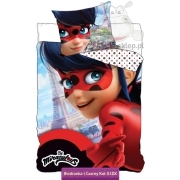 Kids bedding set size 140x200 or 160x200 cm with secret superheroes characters who rescuing the oppression Paris citizen and protecting them from the evil intentions of Hawk Moth the ruler of Darkness. In this collection you will also find beach towels, ponchos, decorative pillows and other accessories for the girl’s room. 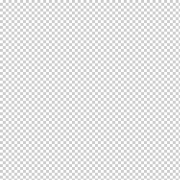 Miraculous Ladybug and Black Cat are one of the most popular series of recent months. A couple of teens who do not talk to each other in school at all, and thanks to Kwami (Tikki and Plagg), who allows to transforms their into perfectly co-operative heroes of supernatural powers that protect the people of Paris. 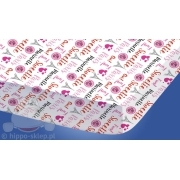 Kids bedding, towels and accessories made under Disney License – a great idea for every seven and eight year young girls fascinated by serial characters.